First Listen: Seun Kuti & Egypt 80, 'A Long Way To The Beginning' Fela Kuti's youngest son brings the fury, funk and sweat of Afrobeat to bear down on financial corruption and other issues. Along the way, he finds grace, humor and plenty of good beats. 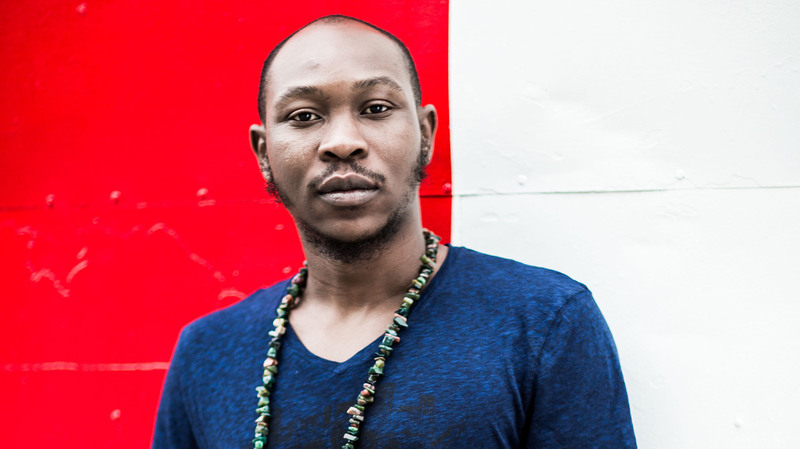 Seun Kuti & Egypt 80's new album, A Long Way to the Beginning, comes out May 27. Here's the starting point for the story of Seun Kuti: He's the youngest son of Afrobeat pioneer Fela Kuti. He began playing with his father's band Egypt 80 at age 8 — and took it over upon his father's death just six years later. Even so, it took Seun (pronounced "shay-oon") a while to take up his father's kingly mantle as a solo artist. For one thing, Seun's brother Femi, more than two decades his elder, had already created his own career following the path that Fela blazed. But even more centrally, Seun decided to bide his time until he'd found his own artistic voice. He eventually realized that Afrobeat was both his inheritance and his platform — funneled, however, through a 21st-century prism. His third album, A Long Way to the Beginning, is a solid articulation of that vision. The 31-year-old certainly pays due respect to his roots. He's still playing with Egypt 80 — roughly three-quarters of whose membership remains from the Fela era. And in "Kalakuta Boy" — a track whose name summons up the memory of the Lagos compound his father founded and declared independent of the Nigerian government — Kuti sings, "I get knowledge 'cause a great man raised me / I show no fear 'cause the great man trained me." Moreover, Kuti was schooled by his father not just in political perspectives, but also in crafting Afrobeat rhythms, textures and structure, albeit in an even harder-driving sound than what Fela offered. He's also, dare I say it, a better saxophone player than his dad. Seun Kuti is at his strongest when he's updating both Fela's philosophies and the Afrobeat sound. It would be so easy for Seun — and Femi, for that matter — to do little more than tour the world as a tribute act. But instead, Seun Kuti brings in smart collaborators. Pianist and composer Robert Glasper produced A Long Way to the Beginning with him; Glasper also appears in several tracks as keyboardist. Dead Prez's M1, who has made something of a secondary career as a guest artist on international artists' politically charged tracks, contributes a verse to "IMF." Ghanaian-American rapper Blitz the Ambassador opens "African Smoke," and German-Nigerian singer Nneka brings soulful vocals to the laid-back closing track, "Black Woman." The pinnacle of that dovetailing of old and new takes place in the fierce and irresistible track that opens the album, whose name is acronymized as "IMF." Kuti takes square aim at the World Bank and the progenitors of the international financial crisis — with a clever video that resurrects one of his father's most potent lyrical metaphors. But just as in Fela's music, there remains ample room for joy, humor and exuberance amid the darkness and fury; the sweat, funk and beat dictate that right from the start. These tracks are for dancing -- if you're not moving, something may well be wrong. In "African Airways," Kuti sings, "We no know where we dey go, but they tell us make we fly." OK, so Kuti happens to be warning against neocolonialism in Africa in this track, but it's a good metaphor for this album. We might not realize where Seun Kuti is taking us when we get on board with A Long Way to the Beginning — but he sure knows where he's headed, and how to get us all there.